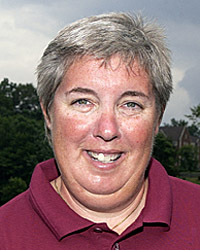 Kay Mitchell Emigh is in her 28th year as the College's head athletic trainer and her 29th overall year at Grove City. Considered as one of the top collegiate athletic trainers in the country, Emigh earned her bachelor's of science degree from Slippery Rock University in 1983. She also received a master's of education from Slippery Rock in 1986. A native of Elizabeth, Pa., Emigh is a member of the National Athletic Trainers Association (NATA), the Eastern Athletic Trainers Association (EATA) and the Pennsylvania Athletic Trainers' Society. Emigh also served as the northwest representative for the Pennsylvania Athletic Trainers' Society Board of Directors from 2001-2004. She lives in Liberty Township with her husband, Tom.